The European Monetary Union is doomed for further political integration; the euro members have no other option but to create a fiscal union and a banking union. 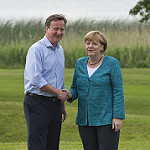 Without these two pillars, the whole Euro will fall apart dragging with it the complete Western financial system. A fiscal and banking union means that these countries have to integrate far beyond the European Union framework. Prime Minister Cameron is an annoyance for the already struggling EMU. The European Monetary Union faces extreme difficulties, as on one hand further integration of the Euro countries is inevitable and on the other hand, the widespread support for this integration is eroding. When the UK is outside the European Union Frankfurt and Paris will have more opportunities to crush London as a financial center. London could not miss Merkel’s warning against gains for British banks under ‘Brexit’4. If the UK decides to leave, Berlin and Paris will do definitely more than prevent London banks from making any gain; they will do everything to establish Paris or Frankfurt as the financial center of the EMU at London’s expense.